Today I spent almost a whole day but couldn't install LN 9.0.1 FP10. This is very embarrassing especially for the one working with Notes for more than 15 years. Did I become too old? 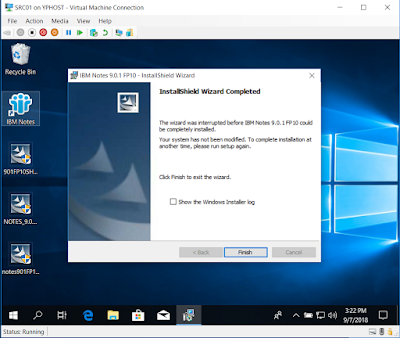 1) I rolled out Hyper-V VM with x64 Windows 10 Enterprise (build 1803). 2) Installed standard 9.0.1 for multi users - all was good at this point. 3) Tried to install FP10 - failed with error "The wizard was interrupted before IBM Notes 9.0.1 FP10 could be completely installed. I started googling by error text "The wizard was interrupted..." but all suggestions didn't work for me. 4) Eventually I didn't have any other options except looking into Installation.log. Line 431: XPD: 9/7/2018 16:23:59 CActionsCommon/GetProperty: DEBUG - Retrieved property: RCP_INVALID_EXTERNAL_JVM_ERROR, Value: External VM is not valid - it must be a 1.5 or 1.6 Sun or IBM VM. I started googling "External VM is not valid - it must be a 1.5 or 1.6 Sun or IBM VM" and found that FP6 had to fix that error. So I cleand VM and did everything again, but this time I installed FP6 at first. FP6 was installed successfully and I (feeling myself on the edge of a victory) started installation of FP10 but got the same dialog with "The wizard was interrupted...". However this time I spotted that error happened almost in the very beginning of FP10 installation - previously (without installation of FP6) it happened in the very end. Line 439: XPD: 9/7/2018 17:30:51 CActionsCommon/GetProperty: DEBUG - Retrieved property: RCP_INVALID_EXTERNAL_JVM_ERROR, Value: External VM is not valid - it must be a 1.5 or 1.6 Sun or IBM VM. Line 613: 9/7/2018 17:31:06 2018-09-07T05:31:06.6--1:00 CCCUActionsApp/RenameDirectory: ERROR: Maximal retry time exceeded. Consider renaming failed. I googled "Failed to rename directory jvm to jvm_old" - but I only found some posts where IBM confirmed the issue and included it into scope of following fixes but there wasn't any workaround suggested. I discovered that FP8 worked OK the same as FP6 - the problems happened with FP9 and FP10 only. - I used some monitoring software trying to catch if any other processes works with Notes-folder during FP10 installation. I would be grateful for any ideas please. I managed to install FP10 IF4 - previously I tried to install FP10 IF2. Still have issue with FP9 IF1 (SHF55). 1) check if FP9 IF2 (SHF123) works OK.
2) try to use older build of Windows 10, for example 1709. The problem was with expired certificate in FP9 installation. It is a bit shameful and strange in the same time: I had the problem with expired certificate in FP9 installation in past and even made a post about it but that time I clearly saw something about "expired signature" in installation logs. This time installation logs didn't have a word about certificate/signature error. The difference in installation processes is that previously I used installation with Notes+Designer+Admin but this time I used Notes-only installation. It's very sad that I forgot about this issue and wasted so much time. Thank you very much to all who provided suggestions in comments to this post. Installation log does not say anything about issues with certificates or signatures as it was described by your link. Thank you though. Thank you. I will try. However I need to install VM with Notes 9.0.1 FP9 as well ( I am testing differences in work of OSGI plugins between Expeditor 3x (Notes with FP prior FP9) against Expeditor 4x (Notes FP10). I can't install FP9 as well on my VM so that FP10IF4 will not help. Thank you so much - FP10 IF4 WORKED! I think previously I tried FP10 IF2. Half of problem is resolved, thank you one more time. For FP9 you should use IF2. Yes, I already got it. Thank you very much for your help. You can see this if you follow where the temp files go using the update log and process explorer. Hi, thank you, it didn't help unfortunately, I worked with user "User" so there wasn't spaces in username. Just in case I tried fsutil 8dot3name query and it returned me status = "2". I tried to set it to "0" - no difference. just setting the property only changes the behaviour on create. It does not create the 8dot3name if it is missing. Forgot to mention that. Access rights may be a problem. I usually install to C:\IBM\Notes. It was a clean Windows. I used user with Admin rights. Installation of standard Notes worked OK, installation of FP6 and FP8 also worked OK. Only FP9 and FP10 failed. I tried to install to C:\IBM\Notes - still had the error. I had all the same errors with FP10, including the JVM error, w/o the expired certificate errors in the install log. The problem is that with time I forgot about this and wasted much time. The better thing is to download the latest FP, delete FP with problems and forget about this at all.